Besides many applications in electronics, they are also used in many commercial products, for instance routers, tablets, printers, switches, hubs, LED fixture, players and tuners, but also laptops of manufacturers like Acer, Asus, Toshiba, Lenovo, Fujitsu-Siemens, IBM, HP and Samsung and many other devices. High quality of components used to produce BQ CABLE DC power cords allows to attain appropriate hardness and mechanical durability. Connectors are molded with injection molding press in temperature of 200-230°C. Depending on detail’s capacity and injection temperature, pressure is from 1900 up to 3300MPa. Grommets (elastic cable cover) by every connector are designed for the best possible protection of cable against breaking caused by over-bending of the cable close to the connector. 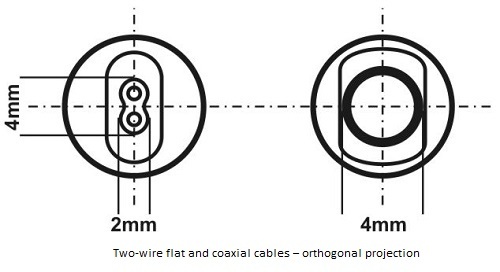 two-wire, flat cable with bare copper cores and cross-section of 0,5mm2 dedicated for load currents not exceeding 5A. Each wire has separate insulation. coaxial cable with wires of bare copper and cross-section of 1mm2 dedicated for load currents up to 8A. One of the cores goes right through the middle of cable, in own insulation of red PVC, while the other has no own insulation and is wrapped around insulated core, as a screening. Outer sheath of this cable is made of polyurethane (PUR) with mate finish, more durable than PVC. All DC power cords from BQ CABLE, which end with connector on only one side, are finished with open-end, bare copper wires tinned on the tips for easier assembly. Moreover every cable with a 1mm2 core with coaxial wire are equipped with an additional grommet. Among DC power cords we offer also splitters, which are available in parallel configuration for instance a y-piece, but also in serial configuration, which is a commonly applied solution in e.g. CCTV installations. Offer is complemented with extension cords, also as polarity inverters. BQ CABLE products are the highest quality, confirmed with flammability tests accordingly to PN-EN 60332-2-2. For a special demand it is possible to manufacture cables with 0,35mm² cross-section wires and structure analogical to 0,5mm² wire, and also using other connectors or different configurations, which is essential in selecting splitters or extension cords.